Coleraine moved back to the top of the Danske Bank Premiership as they fought back from a goal down to see off a spirited Carrick Rangers side. Darren Henderson had given the visitors a shock lead after the home side had missed a penalty from Aaron Burns. But a brace from Josh Carson and another from Burns in the seocnd half sealed the points for Oran Kearney’s men, who leapfrog Crusaders at the summit. Coleraine were without the services of Ciaron Harkin and Jamie McGomnigle, who are on international duty with Northern Ireland Under-21s. The visitors were also forced into several changes with Mark Edgar, Paddy McNally and Gavin Taggart all missing out. Coleraine carved out the first opportunity with 13 minutes on the clock. Chris Johns’s long clearance found Eoin Bradley, who picked out the run of Ian Parkhill, but his first time effort was push away by Harry Doherty in the Carrick Rangers’ goal. The visitors responded immediately as Daniel Larmour’s low shot beat Johns, but clipped the upright and bounced behind for a goal kick two minutes later. Doherty got lucky on 22 minutes as he completely misjudged Martin Smith’s cross, it struck Gareth McConaghie and the keeper managed to grab the ball at the second attempt. Doherty made amends on the half hour as he kept his side on level terms. The keeper got down well to push away Aaron Burns’s spot kick after the hosts were awarded a penalty following a foul on Bradley by Damian McNulty. Coleraine’s woes were compounded seven minutes later as a mix up in defence allowed Darren Henderson to sneak in and prod the ball past Johns for the opener. Doherty denied the Bannsiders again on 40 minutes as he palmed away a long range effort from Josh Carson. 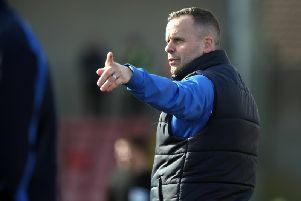 Coleraine made amends two minutes after the restart as Carson fired in from close range after Doherty had denied him from distance seconds earlier. They should have been ahead on 51 minutes as Bradley raced clear following a mix up by Doherty and McNulty, he was pushed out wide though and his attempted effort flew wide of the target. Carrick were still proving to be a threat though, and Johns had to be alert to tip over Eamon McAllister’s effort on 56 minutes. The home side were looking more like their old selves again and edged in front on 58 minutes. It came from a sublime finish from Burns, making up for his earlier penalty miss. He latched on to a clever flick by Lyons before coolly slotting past Doherty. The Bannsiders had McConaghie to thank on 73 minutes as he got back to hack Michael Smith’s goal-bound header to safety. Coleraine should have made the game safe on 80 minutes after Stephen Dooley sent Bradley through, but he was denied by Larmour’s last-ditch tackle. It didn’t matter though as three minutes later Carson produced a superb effort to make it 3-1. Unbelievably though Carrick reduced the deficit two minutes later as Smith slammed home a spectacular effort. The Bannsiders though held on to claim another valuable three points in the title race. Coleraine: Johns, Kane, Parkhill (McCauley 54), Smith, Bradley, Carson, Burns (Dooley 72), McConaghie, Lyons, O’Donnell, Traynor. Carrick Rangers: Doherty, A Smyth (Mooney 88), Sugenor, Chapman, J Smith, McAllister, Scannell (M Smith 61), Larmour, Hassin, Henderson, McNulty (Morrow 78).